because there’s a little mad scientist in all of us! This is a very important part to building a trebuchet! To big and you weaken the swing arm, to small and you will have a damaged axle. Since we are going to be swinging 600 lbs around we wanted to make sure that it wasn’t going to fail. We also wanted to make sure that AS MUCH of the energy is transfered to the pumpkin and not the axle. To do this you just need a really rigid axle, but how do you size it? First thing is to find out how much energy you gain by droping the counterweight. So, we have a counterweight with mass M. We also have a beam with mass B. For simplicity I am going to say that the beam, though it’s size is going to be considerable and should be considered for a complete analysis, is negligible. I am also going to simplify the model even further by saying that the weight is a fixed weight on the swing arm itself. This reduces one degree of freedom and simplifies the problem immensely. What we are actually looking at is now just a simple pendulum. This isn’t a true representation, but should get us in the right ball park. but that is for a linear force. Since our weight is swinging we want angular, and that where the centripetal acceleration comes in. Since the mass doesn’t change the mass cancels out. Now this is better, this is something we can work with. However, we can simplify this even further since h, the height is dependant on the angle of the trebuchet and the length from the axle to the counterweight. So, in my case, I am using a 600 lbs counterweight, and ideally we will be dropping it 135 degrees (measured from the resting position). That’s a pretty significant force. If you were able to do a full rotation your axle would be experiencing 4 times the weight of the counterweight. That’s good to remember when designing your trebuchet! 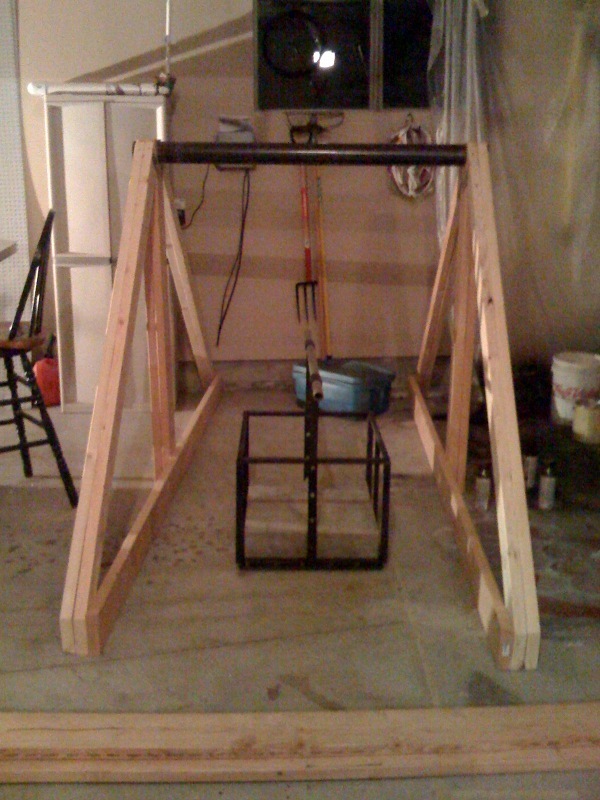 Once again I couldn’t sleep so I thought that I would put my extra time to good use and post this new photo of the trebuchet’s A-Frames. Last weekend, my fellow trebuchetists and I got together to build the trebuchet that we have been designing. I purchased the materials a head of time, and a few of the additional tools that we needed. I also had a drawing of the A-Frame detailed with all of the dimensions and angles. With the tools and the knowledge we went to work on the 2 A-Frames and built them in about 2-3 hours. Everything went really smoothly and there weren’t any hiccups. It’s kind of hard to see the scale in this photo, but from the ground to the bar is 58″. To the top of the A-Frames is 60″ or 5 feet. It seems to be about the right size. It should be big enough to throw some really big stuff, but small enough that it fits in my garage. Thanks to my fellow trebuchetist who helped me build the A-Frames. I have some other photos that I will post as soon as I get them off of my camera. Crazy German’s and a Trebuchet! Ok, so I know this is a commercial, but I really like this actor. He plays a mad scientist so well that he is worthy of being on the mad-laboratory blog. The other reason I wanted to put this video on my blog is the TREBUCHET! I believe that the trebuchet that is used to throw the car is real and not an animation. I don’t know for sure but it looks too real to be an animation. If it’s fake then WELL DONE GRAPHICS DEPARTMENT! Non the less there are some pretty interesting features to the trebuchet. Take a look at the counterweight. That counterweight is HUGE. The way it tosses the car looks really real too. Anyway enjoy the video! I know I did. Ok, so last night I couldn’t sleep. So I decided to go work on the trebuchet design. This is where I currently am in the design process. I would say that the model is about 90% complete. The biggest thing that is is missing in the hook for the tip of the trebuchet, and the sling. I probably won’t model the sling since it can be difficult to model fabrics in CAD packages. Trebuchets are pretty simple in there design. It wasn’t really all that difficult to model, just time consumming since there were a lot of 2×4’s that I had to model. The model accuracy could be better. I glossed over some things for simplicity in my model. 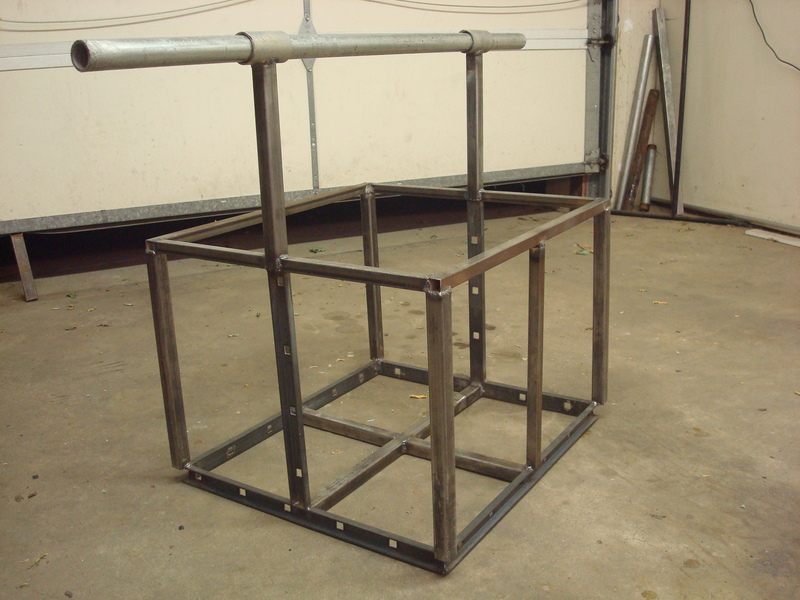 For example the trough is an “ideal trough.” I designed it as a one piece extrusion. Obviously that’s not how I am going to build it but is good enough for a model. I was able to test the basket last night by putting the cement block into the basket. The cement block fit perfectly. The cement block is 1/2″ shorter all around so that it will slip easily into the basket. After I had the block in the basket I was able to pick it up but not very high. So with the holidays coming around like Halloween and Thanksgiving I was interested in a project that would give tribute those great days, all the while sewing seeds of flaming pumpkin destruction. I’m not exactly sure why I decided on a trebuchet, but I’ve been interested in catapults and such since I was a little kid. Now that I am bigger (but still very much a kid) I get to build my own medieval siege weapon. I started thinking about this project around October 1, 2008. I quickly realized that pumpkins are going to be gone very soon and that if I want my chance to chuck a pumpkin I’m going to need some help. So I enlisted my friends who were all to happy to join the my mad laboratory team. 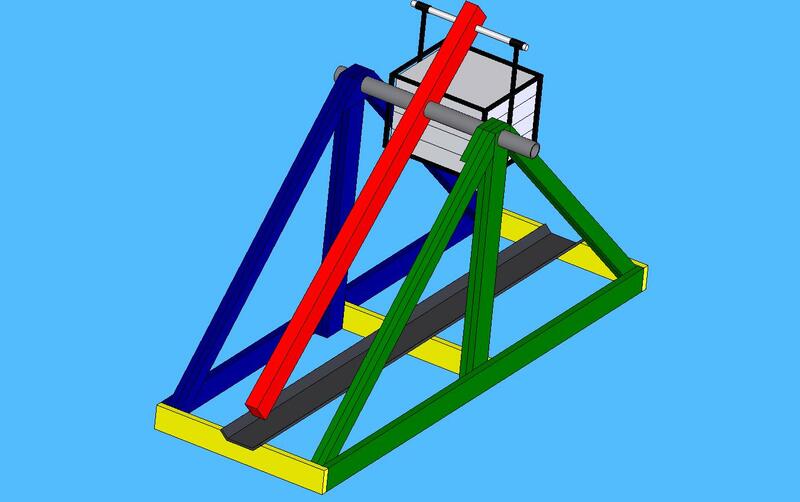 Trebuchets are very simple looking devices. All they have is a counterweight that drops and whips a sling around tossing the contents inside. During the medieval times they would toss all sorts of stuff at the castle walls like boulders, dead horses, etc. We aren’t going to be tossing anything like that. Just pumpkins, and maybe an ocassional flaming pumpkin. Even though they are simple in concept. The design is very complex. For example, the counterwieght should be about 100 times heavier than the object you are tossing. So our goal is to toss a 6 lbs pumpkin about the length of a football field. That means our counterwieght has to be 600 lbs. That’s pretty heavy stuff. When you start swinging 600 lbs around you are going to be generating a LOT of forces. That means that the axles that have to be VERY sturdy. So on and so forth. So as I mentioned before I’ve enlisted some help from my friends since this project is bigger than me! I might be able to do all of this on my own but it would take 5 years to finish instead of 5 weeks. Sir Prichart Jefferson Hunt welded up this AWESOME metal box known as the The Bucket! The bucket is is one of the most important parts of a trebuchet! 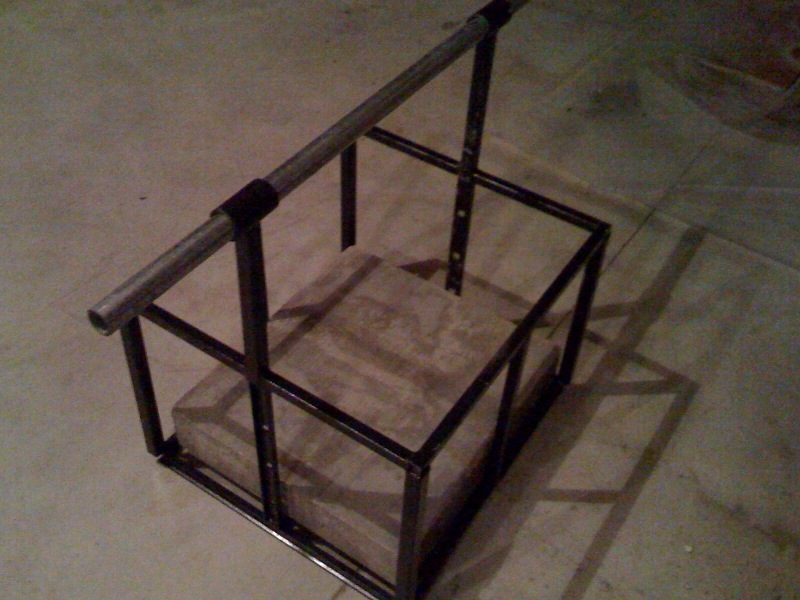 It has to be very sturdy since this is going to be holding about 600 lbs of concrete. Not only does it have to hold the concrete, but it also has to swing it around, generating about 2100 lbs of force. The concrete blocks that I am making will fit into this bucket. I’ve only made one concrete block and I suspect that we will need about 3 – 4 block.